A celebration of biology and the joy of discovery–and a reminder to tread lightly. 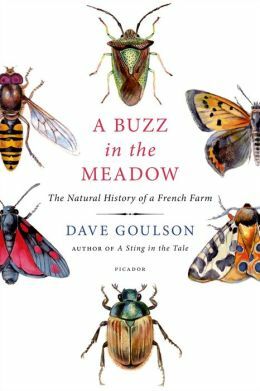 Dave Goulson follows A Sting in the Tale, about his years studying bumblebees, with A Buzz in the Meadow: The Natural History of a French Farm. In 2003, Goulson purchased a 33-acre property with a decaying farmhouse and barn, and turned it into a private nature reserve; here he describes the multitude of wildlife he shares those acres with. His goal is to celebrate the wonder of the natural world–especially insects, which make up roughly two-thirds of known life on Earth. Goulson charmingly depicts the mating practices of dance flies and the many butterfly species he sees on his daily run, and elucidates the habits of the famously cannibalistic female mantis with added knowledge gained through his own studies. A Buzz in the Meadow is both a descriptive work and a call to arms, a reminder that all species are precious and necessary, even the tiny ones. Goulson repeatedly states that conservationists should look beyond large and charismatic creatures like whales and tigers; he perhaps overstates that “the extinction of the giant panda… would not have any knock-on consequences. There would perhaps be a tiny bit more bamboo in a forest in China,” but his point is well taken–that insects make up the majority of life and play an outsized role in the interconnectivity of biological systems worldwide. Goulson’s tone is personal, even humorously self-effacing, but clearly expert. A Buzz in the Meadow accessibly presents natural science and gracefully offers an earnest wake-up call to conservation. This review originally ran in the April 28, 2015 issue of Shelf Awareness for Readers. To subscribe, click here, and you’ll receive two issues per week of book reviews and other bookish fun!